Música compuesta e interpretada por Patrick Doyle. Grabada y masterizada por Nick Taylor. 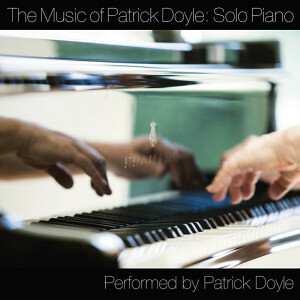 Album producido por Patrick Doyle. Película dirigida por Kenneth Branagh. Interpretada por Derek Jacobi, Kenneth Branagh, Simon Shepherd, James Larkin, Brian Blessed, James Simmons, Paul Gregory, Charles Kay, Alec McCowen, etc. Película dirigida por Régis Wargnier. Interpretada por Catherine Deneuve, Vincent Perez, Jean Yanne, Linh Dan Phan, Dominique Blanc, Alain Fromager, Eric Nguyen, Carlo Brandt, Henri Marteau, etc. Película dirigida por Mike Newell. Interpretada por Gabriel Byrne, Ellen Barkin, Ciarán Fitzgerald, Rúaidhrí Conroy, David Kelly, Johnny Murphy, Colm Meaney, John Kavanagh, Brendan Gleeson, Jim Norton, etc. Película dirigida por Kenneth Branagh. Interpretada por Kenneth Branagh, Robert Sean Leonard, Emma Thompson, Michael Keaton, Keanu Reeves, Denzel Washington, Andy Hockley, Chris Barnes, etc. Película dirigida por Alfonso Cuarón. Interpretada por Eleanor Bron, Liam Cunningham, Liesel Matthews, Rusty Schwimmer, Arthur Malet, Vanessa Lee Chester, Errol Sitahal, Heather DeLoach, Taylor Fry, etc. Película dirigida por Ang Lee. Interpretada por Emma Thompson, Alan Rickman, Kate Winslet, Hugh Grant, Gemma Jones, Tom Wilkinson, Greg Wise, Elizabeth Spriggs, Robert Hardy, Harriet Walter, etc. Película dirigida por Alfonso Cuarón. Interpretada por Ethan Hawke, Gwyneth Paltrow, Hank Azaria, Chris Cooper, Anne Bancroft, Robert De Niro, Josh Mostel, Kim Dickens, Nell Campbell, Gabriel Mann, etc. Película dirigida por Robert Altman. Interpretada por Michael Gambon, Kristin Scott Thomas, Maggie Smith, Camilla Rutherford, Charles Dance, Geraldine Somerville, Tom Hollander, Natasha Wightman, etc. Película dirigida por Jean Beaudin. Interpretada por Noémie Godin-Vigneau, David La Haye, Juliette Gosselin, Sébastien Huberdeau, Gérard Depardieu, Bianca Gervais, Irène Jacob, Pierre Lebeau, Vincent Perez, etc. Película dirigida por Kirk Jones. Interpretada por Emma Thompson, Colin Firth, Kelly Macdonald, Celia Imrie, Derek Jacobi, Patrick Barlow, Imelda Staunton, Thomas Sangster, Angela Lansbury, Eliza Bennett, etc. Película dirigida por Mike Newell. Interpretada por Daniel Radcliffe, Emma Watson, Eric Sykes, Timothy Spall, David Tennant, Rupert Grint, Mark Williams, James Phelps, Oliver Phelps, Bonnie Wright, Jeff Rawle, etc. Película de animación dirigida por Tony Leondis. Voces originales de John Cusack, Myleene Klass, Robin Howard, Matt McKenna, John Cleese, Steve Buscemi, Sean Hayes, Jess Harnell, Eddie Izzard, etc. Película dirigida por Kenneth Branagh. Interpretada por Cate Blanchett, Lily James, Richard Madden, Helena Bonham Carter, Nonso Anozie, Stellan Skarsgård, Sophie McShera, Holliday Grainger, Derek Jacobi, etc.